WE LOVE THIS CITY, and we hope you will, too. Here are some places to go, and places to eat, while you’re here and not at our wedding. 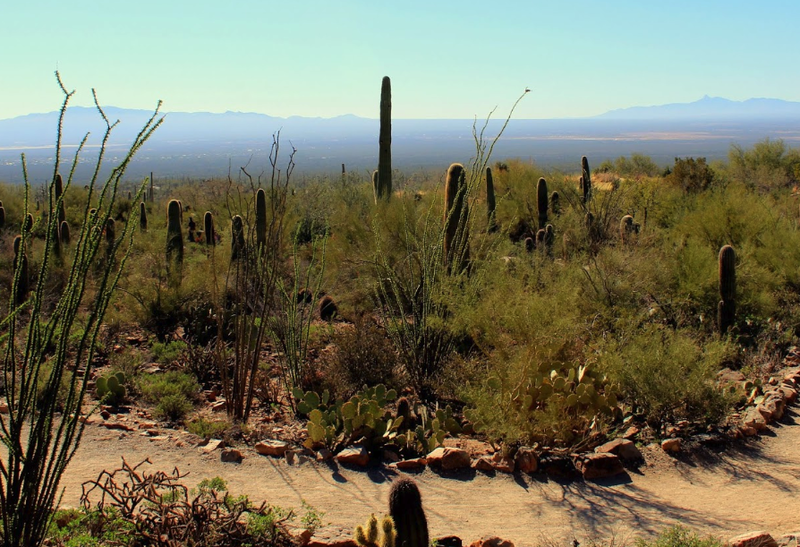 You’re here in Tucson, and I bet you want to get a REAL DESERT EXPERIENCE. You want to see some cacti. Or a ROADRUNNER. OR A JAVELINA. Well, just outside of town is an awesome, expansive, (mostly outdoor) museum where you can learn about the southwest, and also at 10:00 AM and 2:00 PM you can see REAL BIRDS OF PREY WHIRLING OVERHEAD. Seriously, these specific birds were featured on Planet Earth. If you’re one of those people who gets really excited about intricately detailed tiny houses, where someone has spent hours and hours making perfectly scaled-down drapes or a rocking chair that’s like two inches tall, there’s an entire museum in Tucson full of this. For instance, the picture accompanying this blurb is a miniature in their collection. It’s an a whole building full of people saying things like: “whoa, that’s…a lot of work.” To be honest, it’s fascinating. It’s also great with kids! Maybe you’re not interested in very small, intricately constructed things. WHAT ABOUT HUGE INTRICATELY CONSTRUCTED THINGS? There’s a whole museum in South Tucson filled with buildings filled with airplanes. Just hangar after hangar full of airplanes. And behind the hangars is an enormous outdoor space with EVEN MORE AIRPLANES. They have an SR-71 Blackbird! They have a Super Guppy! They even have this thing! Perhaps you’ve heard that Arizona has quite a bit of ASTRONOMY HISTORY? And maybe you’ve found yourself with a long day and a rental car? Well, approximately an hours drive away is the historic Kitt Peak, where you can see a huge chunk of Southern Arizona, and a series of still-in-use telescopes, including the 4-meter Mayall, which, if you’ve never seen a 13 foot mirror, is pretty darn impressive. Built in the late 1700s, Mission San Xavier Del Bac is currently the OLDEST STRUCTURE IN ARIZONA. The building is about as old as THE COUNTRY IT IS IN. There are Free docent-lead tours every Monday through Saturday morning! It’s only ten miles south of central Tucson! ALSO this Mission is a VERY COOL SPOT for SOUTHWESTERN INSTAGRAMMING. This beautiful botanical garden features wonderful walking paths, fun art, and what a brochure would call “eclectic gifts.” If you are coming to this wedding from, say, a place where it’s cold, here’s a pretty great outdoor spot to remind you of what warmth and spring are like, EVEN IN NOVEMBER. Cup Cafe - Map - Eat breakfast on the gorgeous patio outside of the historic Hotel Congress! 5 Points Market and Restaurant - Map - There might be a line, but the breakfast is delicious, and very much worth the wait. Prep & Pastry - Map - Famous for it’s breakfast drinks menu. Nook - Map - Kevin’s favorite dish is a breakfast tamale pie. Bisbee Breakfast Club - Map - Breakfast comfort food with a quick wait. Downtown Kitchen & Cocktails - Map - Upscale dining with an excellent happy hour. Lovin’ Spoonfuls - Map - Vegetarian and vegan comfort food. Seis Kitchen - Map - Try the Crispy Avocado Taco! Martins Comida Chingona - Map - Try the Fish Taco! BOCA Tacos and Tequila - Map - Try the Grilled Shrimp Taco! Taqueria Pico de Gallo - Map - Oh man, try anything. Sidecar - Map - This is the charming cocktail bar where KEVIN AND LARA MET. Tap & Bottle - Map - As the name suggests, this bar features both a wide variety of beers on tap, but a section in the back with bottles and cans you can enjoy as well. Ermanos - Map - There are quite a food beers and wines, but also the food is excellent. The Royal Room - Map - A romantic little beer and wine bar with an excellent cheese plate and rotating bruschetta menu. Lucky Strike Bowl - Map - Bowling! It’s a fun game where you throw something heavy at other heavy things that are far away. Skate Country - Map - Come for the roller skating, stay for the weird paintings of current and past music stars. The Loft Cinema - Map - Tucson’s best independent theatre! The weekend of the wedding will be the LOFT FILM FESTIVAL, so maybe buy some tickets to see a fun movie! They’re playing Wayne’s World on Saturday afternoon, and the director will be there!